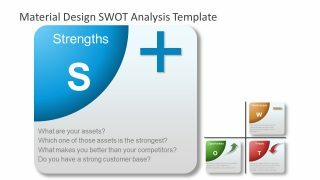 The Material Design SWOT Analysis Template is a 13 slide PowerPoint tool for businesses in every industry. There are a variety of layouts, assisting users to detail their information and textual content in slides breakdown. This template provides a matrix design to analyze the company’s internal and external factors. 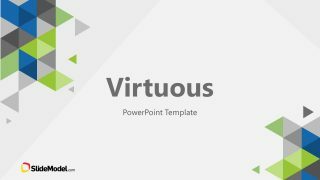 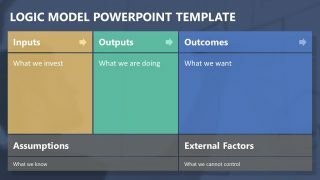 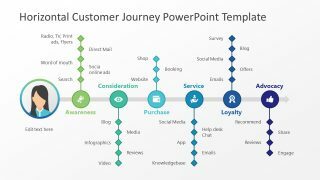 This PowerPoint template is also an entrepreneurial slide desk to explain the correlation of Strengths, weaknesses opportunities, and threats. 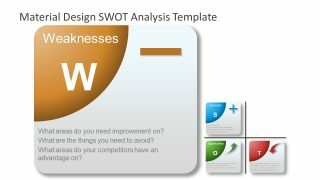 Therefore, it could benefit users in displaying SWOT as a component of business plan. 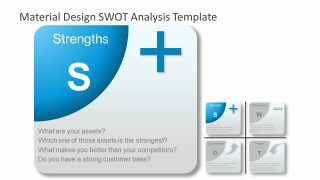 These 13 slides of material design SWOT PowerPoint are also suitable for learners. 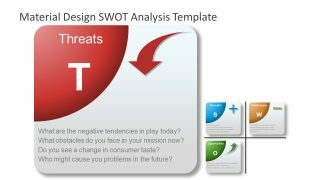 The professors and students can design an informative SWOT analysis presentation by just changing text. 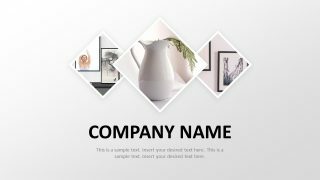 They can also change the size and colors of shapes in the template. This SWOT matrix shows plus sign for strengths and minus for weaknesses as internal factors. Whereas, an upward arrow for opportunities and downward arrow for threats. 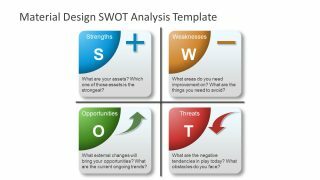 This PowerPoint shows three possible material designs to focus on each element of SWOT. 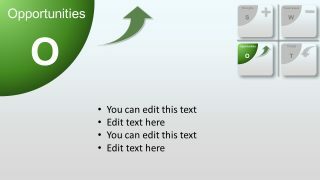 And users can select their desired design slides by copying them into their original presentation.